Recreational diver training is the process of developing skills and knowledge in the use of diving equipment and techniques so that the diver is able to dive with minimum risks. Not only is the underwater environment hazardous but diving equipment can be dangerous, there are unexpected problems that divers must learn to avoid. Divers need practice and a gradual increase in challenge to build their confidence in their equipment and themselves, to develop the skills needed to control the equipment and to respond properly if they encounter difficulties. Most commercial operators and dive clubs serving divers insist that each diver is able to show them "certification", for the type of diving the diver intends to do. Dive operators, dive shops, and compressor operators on occasion have been known to refuse to allow uncertified people to dive, hire diving equipment or have their diving cylinders filled. Many diver training organizations exist, throughout the world, offering diver training leading to certification: the issuing of a "Diving Certification Card," also known as a "C-card," or qualification card. Diving instructors affiliated to a diving certification agency may work independently or through a university, a dive club, a dive school or a dive shop. They will offer courses that meet, or exceed, the standards of the certification organization that will certify the divers attending the course. Reliable and unbiased advice on how to find quality diving instruction can be difficult to come by. There are computer bulletin boards such as ScubaBoard that, at their best provide sterling advice: "How to find an excellent SCUBA class," but that at their worst can be misleading. Recreational diver training courses range from minor specialties which require one classroom session and an open water dive, and which may be completed in a day, to complex specialties which may take several days to weeks, and require several classroom sessions, confined water skills training and practice, and a substantial number of open-water dives, followed by rigorous assessment of knowledge and skills. Details on the approximate duration of training can be found on the websites of most certification agencies, but accurate schedules are generally only available from the specific school or instructor who will present that course, as this will depend on the local conditions and other constraints. The initial open water training for a person who is medically fit to dive and a reasonably competent swimmer is relatively short. Many dive shops in popular holiday locations offer courses intended to teach a novice to dive in a few days, which can be combined with diving on the vacation. Other instructors and dive schools will provide more thorough training, which generally takes longer. Confined Water (Swimming pool or equivalent natural body of water) - where skills are taught and initially practiced. Open Water - where the student demonstrates and refines the skills he or she has learned. The usual sequence for learning most diving skills is to be taught the theory in the classroom, be shown the skill and practice in a swimming pool or sheltered and shallow open water using the minimum equipment, then practice again in open water under supervision in full equipment and only then use the skill on real dives. Typically, early open water training takes place in a local body of water such as a lake, a flooded quarry or a sheltered and shallow part of the sea. 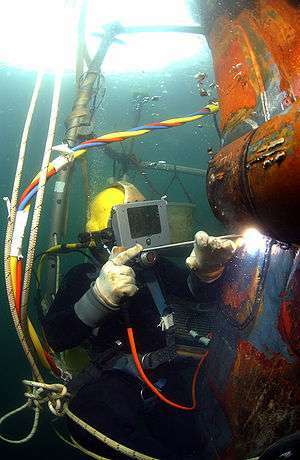 Advanced training mostly takes place at depths and locations similar to the diver's normal diving locations. 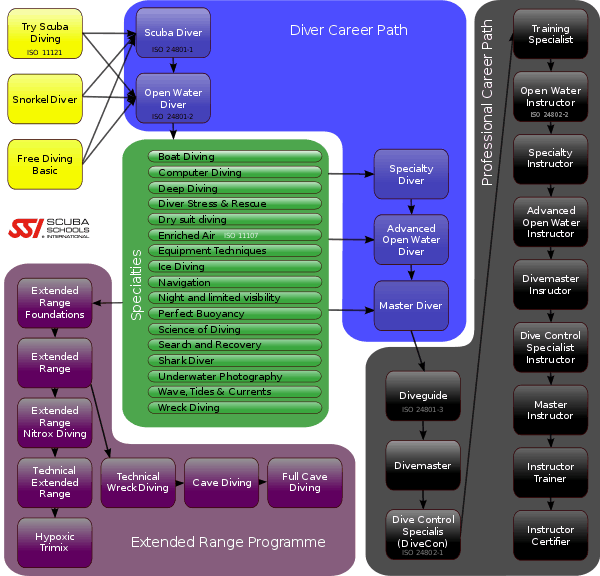 The BSAC diving and instructor grades. 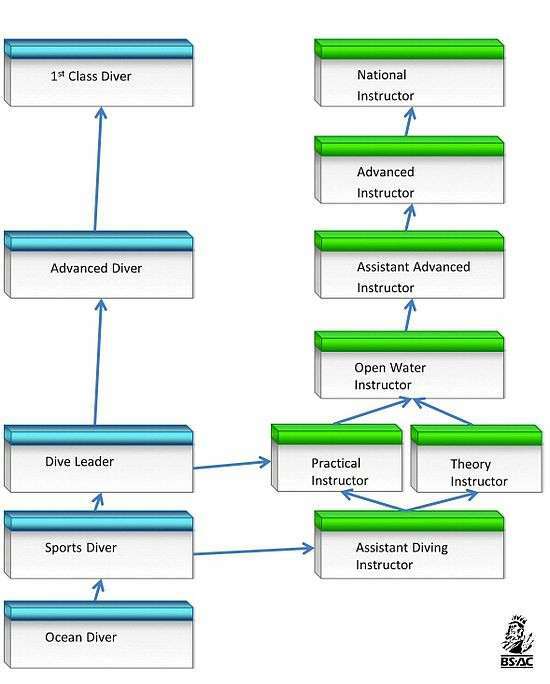 Most entry-level training is similar across the diver training agencies, although some may emphasize certain topics earlier in the program, such as the inclusion of diver rescue in syllabuses such as CMAS 1* and NAUI, and its absence from other equivalent courses such as PADI. Most training agencies have minimum ages for diving and often restrict younger children to snorkeling. BSAC allows 6-year-olds to train for the "Dolphin Snorkeller" grade. From the age of 8 years old PADI has the "SEAL Team program" and SSI have "SCUBA Rangers"  which teach diving in shallow swimming pools. PADI allows 10-year-olds to do the full Open Water Diver course. They are called "Junior Open Water" divers. There are restrictions on their depth and group size when diving. Also they must dive with their parents or a professional. When they reach the age of 12 they can dive with a qualified adult. Over 15 they are considered capable of diving with others of the same age or above. BSAC allows 12-year-olds to do the full entry level diving course - the Ocean Diver course. This qualification has no restrictions for the young diver, but individual branches of BSAC are free to set their own minimum age for branch membership. The International Organization for Standardization has approved six recreational diving standards that may be implemented worldwide (January 2007). ↑ "How to find an excellent SCUBA class". Scubaboard. 2011. Retrieved 2011-12-13. ↑ "C.M.A.S. 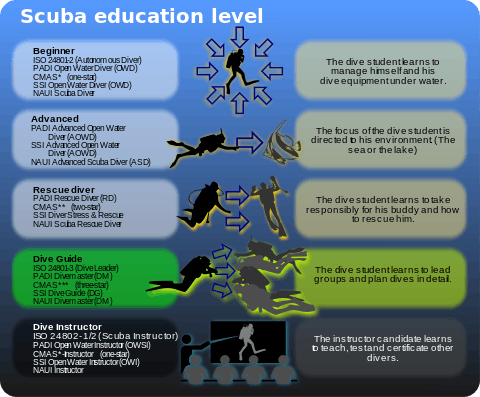 Diver Training Program" (PDF). Confédération Mondiale des Activités Subaquatiques. 2005-01-18. pp. 4, 6. Retrieved 2009-09-23. 1 T 10 and 1 P 6 cover rescue. ↑ NAUI. "Scuba Diver Course". NAUI. Retrieved 26 December 2011. ↑ NAUI (2010). NAUI Standards and Procedures. Tampa, FL, USA: NAUI. ↑ PADI (2010). PADI Instructor Manual. Rancho Santa Margarita, CA: USA: PADI. ↑ "Snorkel Grade Training". BSAC. Retrieved 29 September 2013. 1 2 3 4 5 6 Staff. "Standards for Training Organisations/System". EUF Certification International. Retrieved 28 September 2013.